Microsoft’s idea for the RWA or Anywhere Access wizard is that a total novice can sit down at a server, run the wizard, buy a domain name and associated SSL and let the server do the rest. A great if not bold idea. A properly configured RWA will allow for access to Shared Folders, Remote Desktop to the Server and Internal Computers and on the SBS Standard OS, also the the internal SharePoint and Outlook Web Access. It’s a great tool and one, i think, that plenty of larger organisations wish was available to them. Anyway that is not the reason for this post. Over the last few weeks questions have been popping up in the forums regarding trouble getting the RWA to work, the most common of which seems to be the Certificate Name Mismatch. 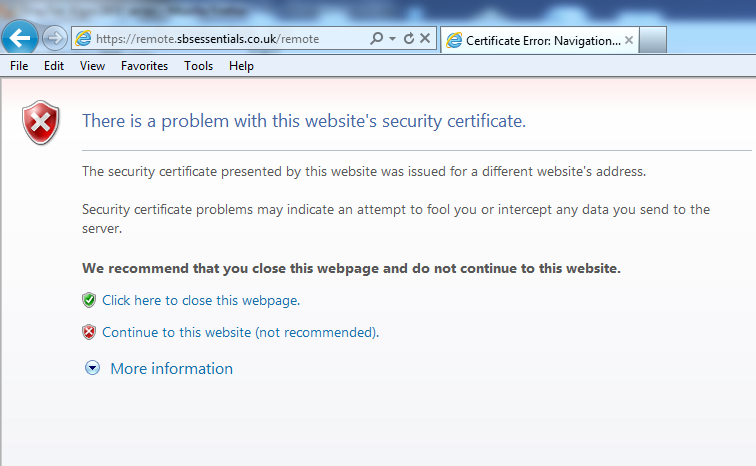 You’ve probably all seen a warning similar to this, this signifies a problem with your SSL. Unfortunately this type of warning does not block access to the RWA, which in turn leads to the issues outlined. If you see this before logging into your RWA, you should expect it to fail. There seems to be some confusion over the role of SSL, how it works and why it is used – leading to all manner of attempted workarounds. All of these issues can be avoided with a little bit of understanding, and perhaps better documentation from Microsoft. It is one thing to want the wizard and tools to work so that a novice can set them up – expecting that same novice to know they are getting the wrong end of the stick and beating about the bush with it is another matter. 1. You must always access the RWA by name, not IP Address. This may seem obvious, but it is fundamental to the way SSL works. Your Certificate is going to be issued to a name, not an IP Address. This leads us nicely to rule 2. 2. The name you connect to, must match the name in the SSL Certificate. If you try to connect to mail.server.com, and the SSL is issued to remote.server.com, you will fail. 3. 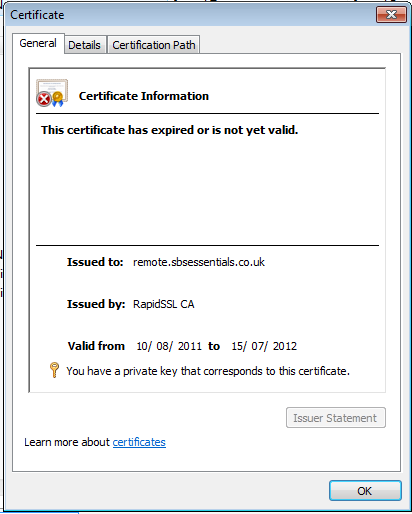 The SSL Certificate must be date valid. Again, perhaps obvious to some, SSL Certificates are issued for a period of time, if you SSL is outside that time period you need to renew it. 4. 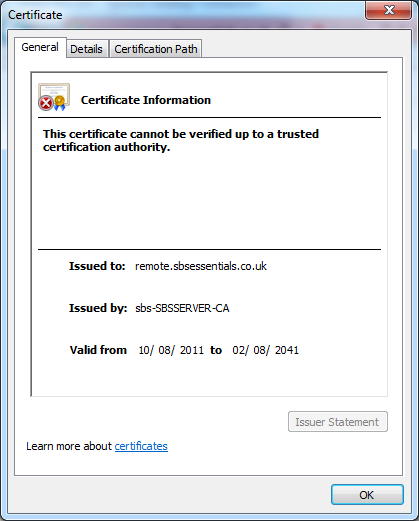 The SSL Certificate must be trusted by the device you are connecting from. Certificate Issuing companies are called Certificate Authorities. There are several big names out there, VeriSign being the main one. You may have heard of others like RapidSSL, GeoTrust, GoDaddy etc. These companies are trusted. That is to say that your device (PC, MAC, Tablet) manufacturer has vetted that organisation and installed their Root Certificate on your device OS. That means that your system implicitly trusts any certificate issued by those companies (and there is a big long list of them). If your certificate is not issued by a Trusted CA, you will have extra work to do to make it trusted. It could be a self signed cert (from an Internal CA) or just a CA that is not well known, either way you must make your Device trust that SSL. If you follow these 4 simple rules you are almost guaranteed to have success. I’m leaving myself some wiggle room on that because there is one instance where the above can be true, and you still have a problem. That problem is Remote Desktop Gateway. 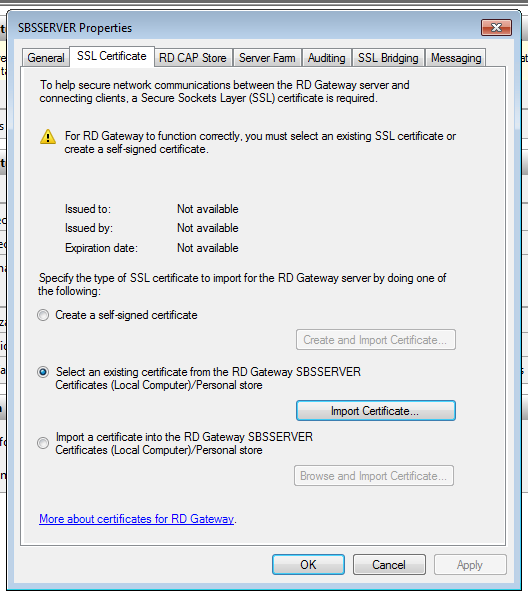 In almost all cases, modifying the SSL will automatically update the SSL for RDP Gateway. However, in some cases, it appears that this is not happening and may lead to this error. How to confirm if that is the problem or not, is quite simple. First you need to make sure you have the RDP Gateway Management tool installed, as it is hidden by default on SBS 2011 and Essentials 2012. 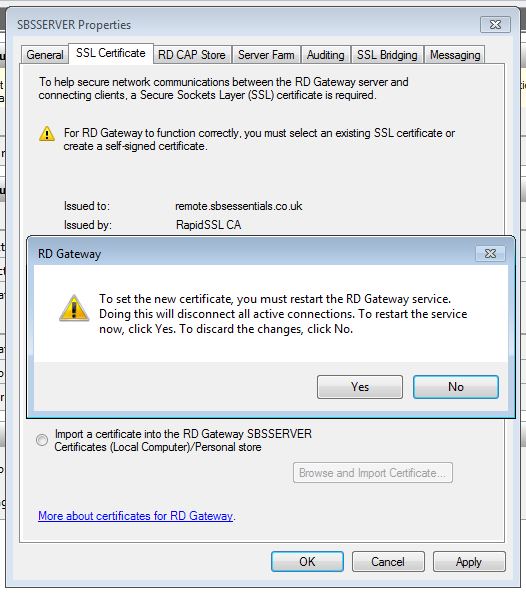 Load up RD Gateway Manager from Administrative Tools and select your Server. If you have a Certificate Mismatch, you will most likely see this error. Considering no clients will be connected given the name mismatch, it seems like a silly question to ask, but i click No. From the SSL tab, click Import Certificate. In the next window we must find our correct Certificate. Remember, it must be In Date, Trusted by remote clients (not just the server) and match the name you use to connect to RWA. Once you have found the correct SSL click on Import and then Apply. The RD Gateway service will restart and all should well with the world, at least as far as logging in to your computers is concerned. I hope this has been useful, and will point you in the right direction if you are getting stuck. I have posted the issue in many places and haven’t gotten any results. Seems like others are seeing the same issues. This doesn’t work on or out of my local LAN. 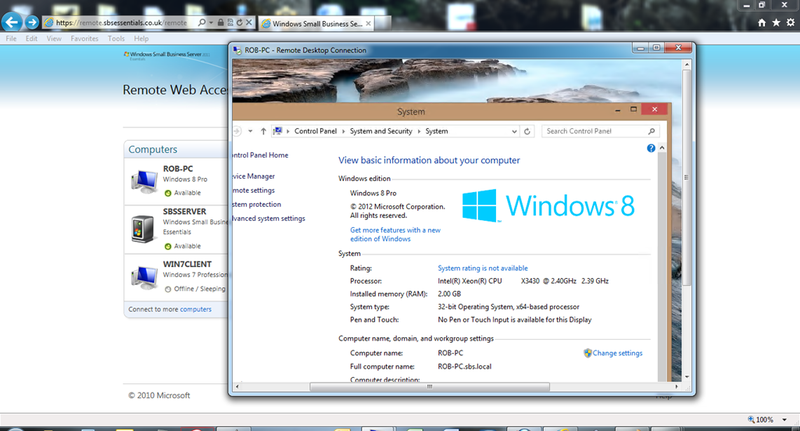 RDP does work on the local Lan without issues. Just not this way. Wonder if you have any ideas on troubleshooting this. 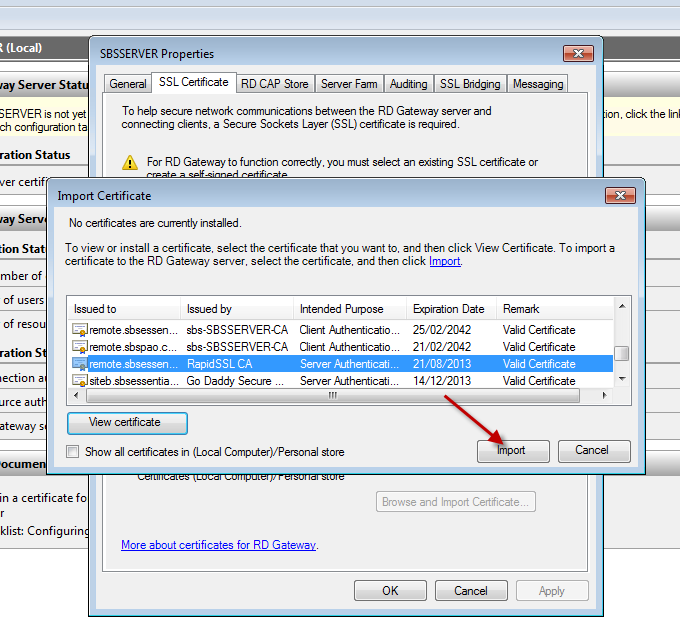 Can we import a UCC (multi-name) certificate if the common name is different? Say we have an on-premised Exchange server and that certificate includes the SAN of the FQDN of the SBS or SE 2012 server. 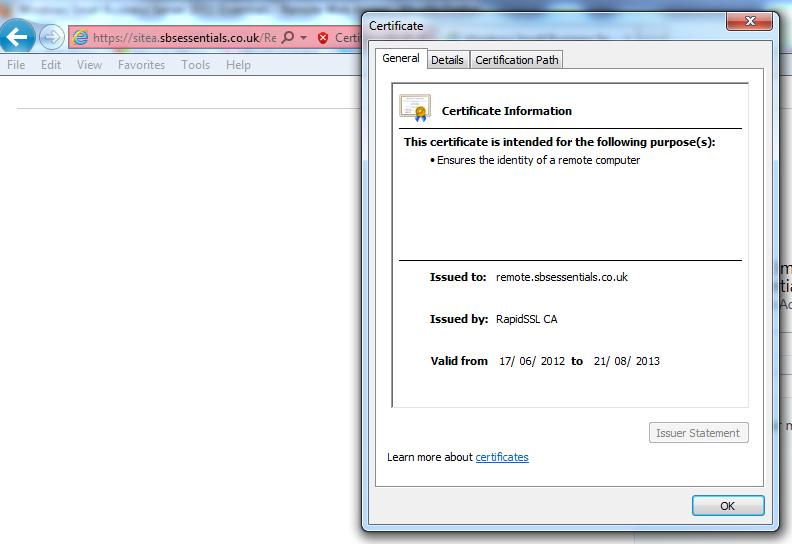 Common name on the cert is mail.domain.com, SANs in the cert are remote.domain.com and autodiscover.domain.com. 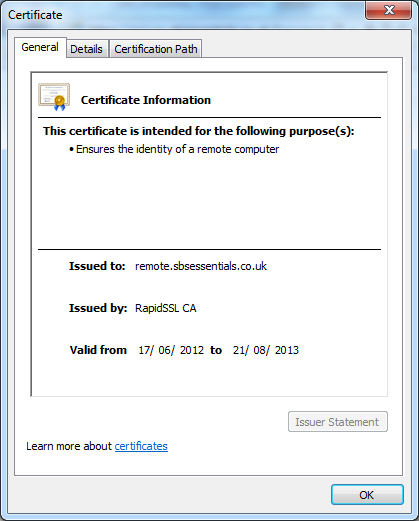 Any reason why this certificate cannot be used? I have never tried it, so i don’t know for sure. On the face of it, it should work, however the wizard may only inspect the common name field and not SANs. I suspected the problem was with the gateway but was puzzled why it wasn’t showing in the administrative tools on my clients 2012R2 essentials server. Thanks Microsoft! Nothing in the event logs or anything else I can find indicates where I can start to look for what’s causing the problem. Nondescript error messages like this are very frustrating. Any ideas for where to begin? Thanks for this post. I have been setting up Server 2016 Essentials and hit a brick wall regarding anywhere access setup. Installing this certificate fixed the problem. It seems that Server 2016 is full of installation bug that need workarounds, most frustrating. thank you for this, reimporting the SSL into RD Gateway sorted my problem.